There is no doubt Hermione is my daughter. Like her mama she loves clothes, books, and vegetables! 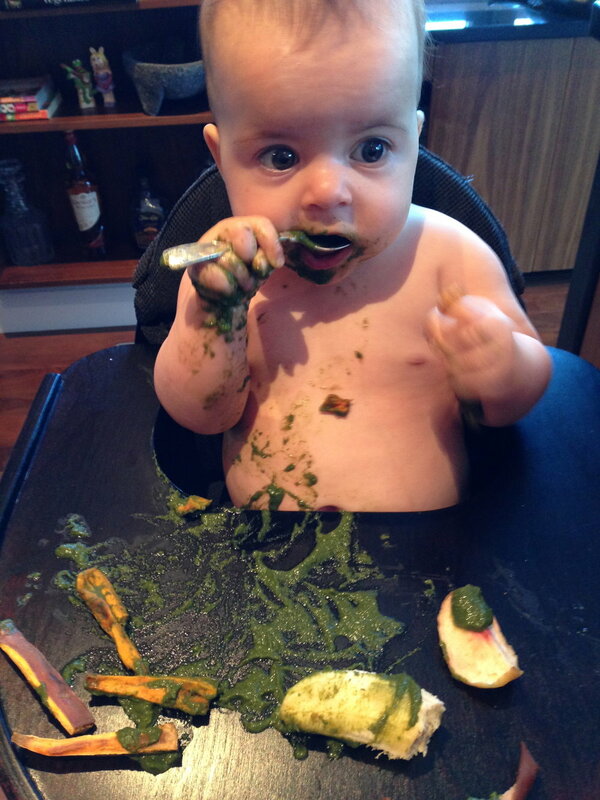 I have to admit I was scared when I first introduced her to my beloved kale. What if she did not love it? Luckily, my girl gobbles up all sorts of dark leafy greens like kale and spinach. She prefers them in a smoothie but has been known to eat a handful or two of sautéed spinach as well! Here is the recipe for Hermione's favorite green smoothie. This smoothie is great for her because it helps her get iron which is one thing not transferred breast milk. After month six when a babies iron stores from birth begin to deplete it is important they get their iron from food. Hermione likes her smoothie with almond milk, but if you are not ready to give your baby nuts (check with your doctor first) water is just fine. I make this smoothie in large batches and freeze it in ice cubes trays. That way I can quickly defrost a smoothie cube for her when it's mealtime!